Save: $70 Limited time offer! Titanium Bracelet: Made of pure titanium (Ti-999). Finish: Brushed with High Polished Center Links. Very light weight, durable, comfortable for everyday wear. Fold-over clasp makes it easy to put on and take off. Clasp is designed to blend with the rest of the links and does not stand out. All links are removable. Allowing the bracelet to be sized to a shorter length, similar to high-end watch bracelets. Very pleased in this choice for a bracelet. The contrasting polished links really bring this piece to life. To me, it has a classic yet modern look to it. Perhaps it has what they call a timeless appearance. The brushed sections do mark easier than the polished, as does brushed vs polished in general. I wear mine all the time, and work with my hands, so mine is starting to accumulate marks. But this just adds character for me. Worth bearing in mind that it is titanium and very withstanding. Still if flawless is your way, I'm sure the people at Avante-Garde will offer you maintenance tips to keep it looking in pristine condition. My wrist is 18cm round. I found it a little too loose, flip flopping around all over the place. Had a link taken out which was a minutes work at the jewelers. Now it sits close, more on the firm side. Good like this for me as it keeps it out of trouble, yet still has ample movement. Avante-Garde offer quality items with quality service, all at crazy cool prices; highly recommended indeed. Bracelet was exactly what it was advertised,, Very Sleek and a Good looking Bracelet...The 8 1/4 fit was exactly correct.I would rate this as excellent! Shipping time was amazing/ 2 days. How thick of a ring do you want? Do you like the feeling of a substantial ring on your finger or would you rather not know it's there? We offer three choices! We will select the best thickness, based on the style of the ring, width, finger size, etc, for a perfect balance between the look and comfort. Thinner: 1.4mm-1.9mm depending on the style, width of the ring, finger size, etc. We will make the ring as thin as possible, without sacrificing integrity and appearance. We will make the ring bulkier, but still keep the comfort of the ring in mind. All our titanium rings are Comfort Fit. The inside of the ring (against the skin) is rounded for comfort. 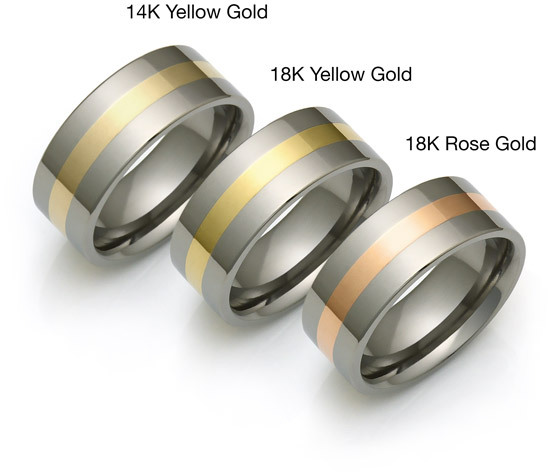 When choosing an inlaid titanium ring, it's important to understand how the ring is made. All of our rings are made only with solid gold, silver or platinum inlays. All inlays are at least 1/3 the depth of the ring. We don't use shallow inlay channels, which lower the cost (less gold used) but compromise the integrity of the ring. Only true karat gold (14K and 18K), platinum 950 and sterling silver is used. 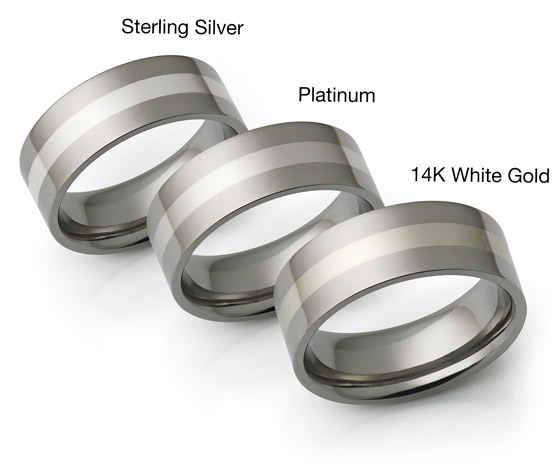 We don't use 12K, 10K or 9K gold, or platinum 550 alloys, which are less expensive, but are subject to discoloration, tarnishing and can cause allergic reactions. We don't make gold plated rings, which look similar to inlaid rings in the beginning, but fade fast as thin gold plating wears off. All of our rings are hallmarked (stamped) with their titanium grade and karat mark, such as 18K, 14K, PL, etc. Please visit our Precious Metals page for more info. All engraving is done in capital letters. We can fit up to 36 characters, including spaces, inside an average size ring. 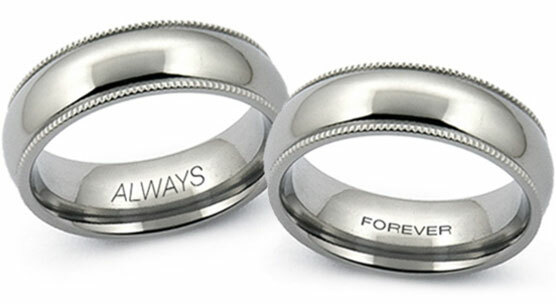 Please note: Engraved rings will be charged a refurbishing fee of $20.00 if you wish to return or exchange the ring. for a snug and secure closure. Elegant in their simplicity, these softly curved boxes offer sophisticated backgrounds for titanium and tungsten jewelry. Faux leather covers the outside and lines the inside of these metal-frame boxes. Brushed aluminum with Polished Trim. 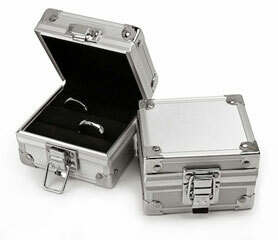 Sleek styling and high-tech finish makes these boxes a contemporary choice for presenting titanium and tungsten jewelry. 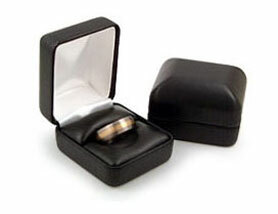 The box will easily hold up to 4 rings, necklaces or bracelets. The ring insert is removable allowing for other uses. Great for travel. If you are looking for an unusual gift box to present the ring, this is it! Every titanium ring is individually hand crafted after we receive the order. This allows us to offer you a choice of different widths, finishes, Ti grades, inlays, etc. Our standard production time for titanium rings is approximately 7-10 days (rings with stones or platinum inlays may take 1-2 days longer). 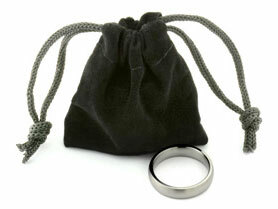 Rush Order Service is available for all our Titanium Rings. ($39.95 additional). Sizing set will be sent via Priority Mail. Your ring will be manufactured in 1-3 days. Order will be shipped the same day the ring is made. If you are sure of your finger size and do not wish to receive the sizing set, simply check the "DO NOT mail Sizing Set" check-box, and we will start production right away. Please visit our fitting-help page for more info. Please note: Rush Order fee is not refundable.